Simon Thompson runs an agency in Melbourne, Australia, that focuses on helping B2B businesses add podcasts to their content marketing mix. Simon Thompson is a podcast content marketer, and founder of Content Kite. In past roles he has worked on major content projects with publishers such as Daily Mail and MSN, and brands such L’Oreal, Nissan, Disney and Nike to name a few. He now focuses solely on Content Kite, helping B2B companies establish authority and build relationships through podcasting. Hi, everyone. Welcome to episode number 30 of the Content Strategy Interviews podcast. I’ve got with us today Simon Thompson. 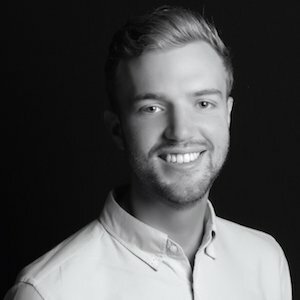 Simon is a content marketer down in Melbourne, Australia, and he runs an agency called Content Kite which is a content marketing agency focusing on B2B customers. I’ll let Simon tell you a little bit more about what he does. Thanks very much for having me, Larry. Glad to be on. So, yeah, I started out a career in content marketing, or rather advertising and media in the realm of print media, but not in the kind of fancy, glamorous print media magazines that you might be thinking of. It was while I was in a sales role and we were selling print ads to construction and architecture companies for the companies that were specifying hexagonal screws for big building projects. So really industrial, kind of boring, at least for me, print media. Needless to say, I did learn a lot about, I guess, the basic principles of content marketing throughout that role. And I won’t dwell too much on that, but it eventually led to a role at a company called Ignite Media Brands. And they were essentially the content solutions house for brands like MTV, Nickelodeon, FX, which was like a branch of Fox in Australia, and a number of others. And so I worked on a number of great projects there. That company ended up going under shortly after I joined, which was unfortunate. However, that was kind of a blessing in disguise because it led into a role where I really sort of cut my teeth in content marketing. And that was at a company called Mi9, which is a joint venture between Microsoft and a broadcast network in Australia called Channel Nine. And we were working on pretty major projects for the likes of L’Oreal, Disney, Nissan, Nike, Adidas and many others. And they were actually in partnership with Daily Mail. So at the time it was the number one digital content publisher in Australia, which is probably like tiny in terms of US population but in Australia it was a pretty big deal. So I hung around there for about two years, got the entrepreneurial bug, moved to the States and started my own agency, Content Kite. And we originally started out mainly working on text based content, and now we’re sort of focusing more on podcast content. And that’s where we are now. Cool. Now, tell me about how you made the decision to transition into that. Because everybody’s talking about podcasts. Everybody has a podcast now and it’s obviously, and for me, as a guy who’s only recently re-identified as a content strategist, it’s part of my content marketing strategy to position myself as an expert in the field. So it’s a common way for people to do that. But most agencies will offer a broader range of services. How did you come to focus mostly on podcasting? Yeah, it’s a really good question. So, I mean, for starters I would never suggest that podcasting is like the be all, end all of content, you should only focus on podcasts. We made the decision. I mean, we still do text based content, but our primary focus now is podcast content. And that’s mainly because I’m just a big believer in focus. As a business owner I like to focus very hard on one thing, and so that’s where the focus is now. But there are some good reasons for that which we’ll get into. One is, in terms of engagement as a content medium, podcasting is really kind of hard to beat. And the reason that is, I mean, with text and even with video content, I mean, a lot of people think video’s kind of the be all, end all. But video is still open to the distractions of things like email and Slack and every other thing going on in your browser window. Where audio has the clear advantage is that most people are listening as what I’d call a captive audience. And that is to say that they’re driving or they’re at the gym or they’re doing something else. Like I always do it while I’m washing the dishes, which makes a really boring task like just kind of I almost look forward to it now. And so what that means is the, well, the statistic is that 80% of people who listen to a podcast episode listen to the whole thing. Which, I mean, if you think about that in terms of a blog post or even a video, that’s just basically unheard of. And so if engagement is the name of the game, and for mine that’s kind of where I see the main metric being, than audio kind of has that advantage. And there’s a number of others which I can go into, but that’s sort of the primary reason. Well, that’s super interesting to me because that’s so … Like I came years ago I did SEO and I still follow that field pretty closely, and I know that kind of that we’re in a new kind of a post link, post content, post keyword generation there of like UX experience. And the user experience and engagement are increasingly important there. And I think that’s important across the board, not just in SEO and things. So that, I had not heard that statistic of 80% of people finish it. That’s gold in that so I’m beginning to understand the popularity of podcasts. One of the things you also mentioned though was that seems like a really good metric to show to the people who are investing in content to say, “Hey, people are really engaging with you when you do this podcast.” Are there other sort of ways that you measure the effectiveness of your podcasting marketing efforts? Yeah, sure. So in terms of measurement, it is a notoriously hard channel to measure. However, there is one other kind of benefit, and this is something that we see working with B2B brands. And this is kind of outside of a primary content marketing benefit. But kind of as a sales channel or a way to get your foot in a door with people. And like I said, this is outside of the content marketing benefit. But, for example, Larry, I imagine out of the guests that you’ve had on your shows, you have built relationships with people that you otherwise probably just wouldn’t have opened up. And whether or not you’ve been deliberate about who you’ve had on the show, I’m not entirely sure. But to give you an example, if you’re a sales team or a marketing team and you want to connect with senior level decision-makers, well, one way to do that is to send cold emails. Which isn’t entirely compelling ’cause it’s just like, hey, buy my stuff. But if you changed that email to, “Hey, we’d love to interview you as a guest on our podcast and feature you as an expert and have you tell your story.” Well, that’s very compelling to begin a relationship. And then once you have that relationship in place, if it makes sense to do so you can sort of nurture that and perhaps turn it into a partnership. And that is very measurable. I mean, if you just create a guest list of people you want to meet, you can measure how many sales meetings that you create. Now, that’s all outside of the primary content marketing benefit that people may think of as podcasts. And I would caveat that if that is a strategy that you’re using, the content’s got to come first. It can’t just be like I have this ulterior motive of I just want to get meetings. But if you can make it a win, win, win, where it’s you win because you get this relationship and a foot in the door with the person, the guest wins because they get a platform and a free marketing channel, and the listener wins because they’re obviously getting free content, then that can be a beautiful thing. So that component of it is measurable. Outside of that, it is notoriously difficult to measure. And I don’t have the answer in terms of how you can measure ROI. You can do things like use redirect links and track those links and how many people click on those links. But it’s not like something with, say, measuring blog content or something like that where it’s you can embed a whole bunch of code on your site and really see what people are doing. Right. That’s interesting. That gets to one of the unique characteristics of a podcast, is it’s sort of out in the wild. You have it uploaded to a media server someplace, but then all these different syndication services are picking it up, like iTunes and SoundCloud and whoever. And so there’s more so than other kinds of content, I think there’s many more distribution channels. And so just having a tool that would aggregate all that and tell you. You know, just the statistics with any one of those is probably … Have you dealt with that? Are there like aggregators that will add all that up for you? Or how do you account for that? Well, it all comes down to whether the feed provider themselves, so say if someone’s listening to this on iTunes, then the people who are going to have the data, the only people that are going to have the data on how much of an episode people are listening to and who’s doing what in iTunes, is Apple. And they’re not giving up that data. And that’s where most people are listening to podcasts, by the way, so unless they choose to give up their data. I believe some of the feeds will release more data than Apple will. However, it’s just there’s just not as much data, which is unfortunate. No, that’s right. And it would be I can picture all kinds of methodological problems with inferring from a small dataset what might be happening at Apple, yeah. Yeah, so many problems there. But that’s interesting. But, like you said, you can still track like who you talk to and the relationships that ensue. Probably analogous to something like advertising. When you get advertising out into an ad network, there’s a similar sort of, I mean, you get some reports from the ad networks and things. But it kind of gets back to that idea of like branding versus action based advertising. Is there anything analogous in the podcasting world where, for example, a lot of podcasts will include like a URL in the sponsorship segment that has like slash, you know, Larry’s interviews or something like that. I know that’s one way. Are there other ways to track? That’s the main one, yeah, redirect URLs. I mean, you can obviously track how much traffic is coming through to the show notes page. However, most people listening are just going to be listening on their pod catcher app. Well, I mean, maybe I shouldn’t say that. I think in most cases most people are going to be listening on their pod catcher app. And so tracking those redirect links is one way to do it. But say if someone came to me and they said we want to start a podcast and the reason we want to do it is ’cause we want to have this flood of leads and traffic and things to our business, I’d say, well, probably don’t start a podcast. ‘Cause the primary benefit, outside of that building relationships which you can get measurable results with, but outside of that it’s more of a branding and thought leadership and credibility building tool than it is like a straight out lead generation channel. I mean, yes, you can still generate leads and sales through the listenership, but for the commitment you put in there are probably quicker ways to do that and probably more effective ways to do it. Right. Well, it’s just like any other medium in content marketing in that sense, in that like it’s a longterm play. And you can’t, it’d be unreasonable to expect instant results. And especially you do mostly B2B, and that’s typically your classically longer sales cycle. So you may never know exactly which article they read, or something like that. I guess you kind of infer from like the amount of engagement. And, I guess, let me back out a little bit from that and ask how, ’cause I know you’ve done a lot of conventional content marketing as well as just podcast focused content marketing. How do you see podcasts fitting into the mix, and are there sort of sweet spots where a podcast makes more sense than blogging or videos or other kinds of content? Yeah, that’s a really good question. So, I think where a podcast really helps is, like I said, it’s just a far more engaging medium. And especially in the B2B world, that whole know, like and trust factor is really quite key. And so having something outside of the content itself, so whether it be the personality of the host and just something that people can kind of have an affinity with. And, I mean, so many people in the B2B space, if they have a podcast and then they speak to someone who’s been listening to the podcast, the listener will say, “Oh, I feel like I’ve known you for six months.” And they kind of do because you’ve been in their ears for six months, and you’ve never spoken to them but they’ve heard you. And so that’s sort of a really key component of it. But outside of that, in terms of where it fits into a broader content marketing mix, I mean, in much the same way that blog content or traditional content isn’t going to be the only thing that’s going to get a sale over the line, podcasting’s the same. It’s part of the mix. I mean, especially in B2B. Like there’s always going to have to be a one-to-one conversation in general, like a salesperson or a founder or someone’s going to need to speak to the customer. So that’s going to be part of the sales cycle. But then outside of that there’ll be all these credibility indicators, so you might show the customer a case study and a podcast could be sort of one of those credibility indicators and one of those sort of things that shows that you know what you’re talking about essentially. So it’s part of a mix and not going to be the be all, end all that drives leads and sales like no-one’s ever seen before. Mm-hmm (affirmative). Yeah, but again I’ve done so much SEO. I keep putting things in those terms, but in SEO it’s gone to like the number of signals that they consider in evaluating content for what to display first. They look at so many a variety of signals, and there’s something analogous going on in content marketing where they’re looking at a variety of things. One thing about that mix of content too, I’ve heard you talk in other contexts about repurposing content. Can you tell me like a classic or typical kind of life cycle of an idea that manifests as a blog post and a podcast? Like how does that typically work and how much of that do you do? Yeah, and this is another reason why I’m quite bullish on podcasting. Because you can have one 30 minute interview and that can turn into, I mean, like we’ve made it turn into 12 pieces of content. So, I mean, it could just be like a social media post and if you call that a piece of content, well, that is one piece of content. But in a more practical sense, one interview can easily turn into like a long form blog post. And I think one of the biggest problems people have, especially when they outsource content creation, is they outsource to someone who doesn’t … Like they’re are a writer and they don’t really know the ins and outs of what they’re writing about, or not necessarily. Whereas if you hand an interview off to a writer and say this is the content, can you create something out of this, and they’ve got a really rich data source and they’re not just Googling around and seeing what everyone else is writing about. They’ve got a, you know, at the source, really good piece of content to create something long form out of. Or it could be short form. But in terms of what a podcast can turn into, it can be a blog post. I mean, you can record the interview like we’re doing now. And then you have a video and you can create social media short clips. It’s a really re-purposable format. You can create gated content like lead magnets or cheat sheets and things like that. So it creates a lot of content out of what’s quite, I don’t want to say easy to make, but it’s not a huge time commitment. One 30 minute interview can become a lot of things and a lot of really rich pieces of content. Right. I can see another benefit of that. One of the things that’s so important in, well, just marketing and life and content marketing in general these days, is speaking with an authentic voice and like being, you know, having a voice and being. And it seems, like you said, that a lot of people just practically you don’t, not everybody has an editorial staff to write this stuff. So if you can hand off, I can see the benefit of handing a content like an interview transcript to a content creator and them creating a lot more compelling stuff. Yeah, so another advantage of it. You know, something you said earlier too about whether a social media post was a kind of content. I was having coffee with a friend earlier today and we were talking about it. She’s a copywriter and we were talking about how she does it. She just recently started offering this bundle of services where you do the copy for a place, but she’ll also do the copy for the email that’ll announce the release of that content. She’ll do all the social media posts. And I was thinking, ’cause that’s kind of what I’ve done for the last couple of years with everything I’ve done is sort of this bundle of content as I’m creating it. Do you do that? Is that baked into your podcast production? Do you have the sort of ensuing promotional stuff built into the procedure as well? Yeah, definitely. So, yeah, we were talking offline before about this, but we were just kind of under the assumption that doesn’t everyone just do that? Like don’t just you post it on social and then you wrote an email to go along with it? And as we discovered, not everyone does. So, yeah, we bake it in. And there are a number of things that should just be givens when you put a piece of content out there. Posting to social is one and creating an email and newsletter is another. And then outside of that, I mean, it used to be maybe eight, 10 years ago, you could just write, say, a blog post and Google would rank you for it and you’d reap the benefits. And that’s just not the case anymore. So you need to be doing a lot in the way of content promotion to get it out there. So you can do things to share it with your own audience. But there should also be other things you do to attract new audiences as well, outside of just hoping for the SEO benefit. So things like using tools like Quuu Promote where you essentially get a network of people who have signed up to have content pushed out to their feeds. You can pay to get into that feed and have it pushed out into certain categories. Now, that’s paid media but there are also other free methods like reaching out to certain people who maybe you’ve featured them in the article. And, by the way, this is a really good benefit of content. When you interview someone on a podcast, essentially all of your guests become promoters of your content and your brand. Because they’re going to be incentivized to share the interview, because they’re usually positioned as sort of an expert or some sort of authority in a given topic when they’re in that interview. And so it’s very much in their interest to share it. And so a simple ask, “Hey, would you share this when it comes out?” They’re usually like absolutely, yeah, sure thing. And whether that be on social or email or what have you, yeah, that’s another way to do it. But to answer your question, yes, content promotion is extremely important, yeah. Yeah, I think and like we were saying when we talked before, that like, yeah, the content isn’t done until it’s promoted. It’s like you’ve got to get the word out. The other thing, we’ve hit on it a little bit, but I’d love to revisit the ROI equation. But specifically in terms of dealing with clients or just in your own efforts. Like how do you convince people that there’s a benefit to this? You mentioned, you know, I can see the benefits of engagement. We talked about that before. But just I’m just thinking of the really bottom line focused executive who’s like, “Wait a minute, why are we doing this?” What do you tell them? How do you convince them it’s working? Yeah. So it really does depend on who you’re talking to. I mean, like one way to think of it is so if you speak to a company about you need a logo, it’s pretty hard to quantify why they need a logo. But they know they need a logo. And a podcast, in terms of the branding benefit, is a bit like that. It’s hard to quantify but it can be a really good way to differentiate the brand. But if you’re speaking to a very numbers focused person, then I would be more inclined to lean them towards the opening up relationships that could turn into bottom line dollars. So there’s three main categories that we put it into when we say, well, let’s create an ideal guest list. So first we create an ideal listener profile, and then we’ll say let’s create an ideal guest list. So if these people have something to tell the audience, that’s first. That’s got to be first. Then who could we get on who could be of benefit to us while we also benefit them by giving them a platform? And so those people fall into three main categories. So one is potential sales prospects. So like maybe it’s tier one clients who would be difficult to reach unless you had something to offer them, such as their platform. The second is referral partners or strategic partners. So who knows people who you could potentially work with? That’s another route. And then the other one is influencers, which I know is an incredibly overused term at the moment. But essentially just someone with an audience. Who could we get on our show who has a large audience of the people we want to work with? And then they could potentially share us with their audience down the line. So they are kind of the three main categories. And if someone’s incredibly numbers focused, and to an extent I am myself, that’s sort of the main benefit I would be showing to that person. You can show them, yeah. Yeah, and everybody measures it differently. I think there’s a growing awareness that there are these qualitative elements as well as the hard quantitative. I think the promise was like, oh, it’s the internet, you can measure everything precisely. It’s like, well, maybe not so much so. And there is some work you can do with the redirect URLs, like if you just have like a simple plugin like Pretty Links on WordPress. So if I was to say go to contentkite.com/contentstrategyinterviews, and I’ve got a free bundle there that people can pick up, I’ll see how many people typed in that URL and picked up the bundle, and then I can tell how many people came through that. And then I could put something in my marketing automation platform that says these people who are now in my email sequence funnel came from that unique URL you set up. So there are certain aspects you can track. But it’s not kind of this all encompassing, like with blog content where you can track like literally everything like where did someone come from? Like all of that, yeah. Right. And one thing, so we talked a lot of there’s kind of two models that people talk about when they talk about content marketing. We’ve touched a lot on kind of the sales funnel model leads and prospects and sales coming in from that. But there’s another model that people talk about a lot, sort of the customer journey and mapping content to the customer journey. Are there places in that journey? Well, I know the journey is different for every customer, but are there places in the journey where podcasting content tends to do better? Like there’s that kind of early stage of awareness, and then sort of thinking about it and then deciding and choosing. Have you given much thought to that? And if so, is there a place where podcasting fits in there? Yeah. I mean, when I have given it thought I think it does map onto all parts of the journey. But actually, surprising, what I’ve found and what our clients have told us a lot of is that the part of the journey where it’s most relevant is actually people who have already bought. So current customers, and then they become very, very loyal customers. So that’s one. But in terms of like the consideration phase, it’s very relevant there. I mean, I personally know of at least one product that I’ve bought only because I liked the podcast. Like I didn’t even shop around. It was Drift. I’m not sure if you know their podcasts, but Seeking Wisdom, it’s a really good podcast. But they have a live chat tool and they just have a really, really good podcast. They have really good content in general. But I knew that when it came time for me to get a live chat tool on my site, like I was going to use Drift and there was no two ways about it. And also, obviously, in the awareness phase. I mean, just as a sort of general content platform you can, well, easily become aware of brands as well. So I think it maps on everywhere. But to answer your question, I feel like the current customer phase, if you have the type of customer that can stay with you over a long period of time, a podcast can really play into that stage of the journey really quite well. Got it. Cool. Hey, I notice we’re just coming up on time. I always give folks a chance before we wrap, I want to just ask if there’s anything last, anything that we haven’t talked about or anything that’s on your mind lately that you’d like to share with my folks? Yeah, sure. Thanks for asking. So there is one thing that I’ve been thinking a lot about this lately. And I’ve been doing a lot of LinkedIn videos about this as well. And that is just like differentiation on your service alone is becoming near impossible. So I’m speaking mainly in the context of B2B services. So agencies and, yeah, B2B services. People will say, well, we have a differentiated process and we’re different in this, that or the other. However, in general in the perception of the customer, B2B services are becoming commoditized. And so what I’ve found is that really one of the only differentiators that can be like a true differentiator is personality and your perspective on a take. And that’s kind of why I’m so bullish on podcasts, because it’s a really good way to get your personality across. But, yeah, just I’ve been thinking a lot about that lately in terms of just how difficult it is to differentiate yourself. And I think that’s mainly because of how there’s a really low barrier to entry to start a business these days. And so there’s just a lot of competition. And so standing out based on your service alone is very, very hard to do. And so I think the main takeaway from that is I think service providers specifically need to really start to think about how they can get their personality across and their perspective across, and their true differentiators across. I love that. You’ve got me I’m going to think on that a lot. Because one thing that occurred to me as you were talking there is that it’s sort of like the internet has been successful that it’s so the best practices are widely known and shared, and everybody kind of has access to the same tools and knowledge and information that there probably is some truth that there’s fewer and fewer proprietary things that each agency could offer. And that style and personality are always the standout. I appreciate that insight. That’s interesting. Yeah, yeah. And, I mean, you can definitely be different. Yeah, you can definitely be different but in general, in the perception of the customer which is what matters, then it’s very hard to differentiate yourself in their perception other than true personality. True personality. Yeah, great. Well, thanks so much, Simon. It’s really been a joy talking to you. I’ll, yeah, look forward. We were talking before we went on the air, it’s like I’ve never been south of the equator but if I ever get to Australia I’ll look you up. So thanks so much. Yeah, definitely. Yeah, cool. Thank you so much for having me, Larry. It’s been a blast. All right, cheers. Bye bye.